Early 2016, I took a trip First Class on a Qatar Airways Airbus A380 from Doha’s new Hamad International Airport in Qatar to Charles De Gaulle Airport in Paris, France. Qatar Airways has six A380s in its fleet, deploying them on medium-haul routes from Doha to London, Bangkok and Paris. 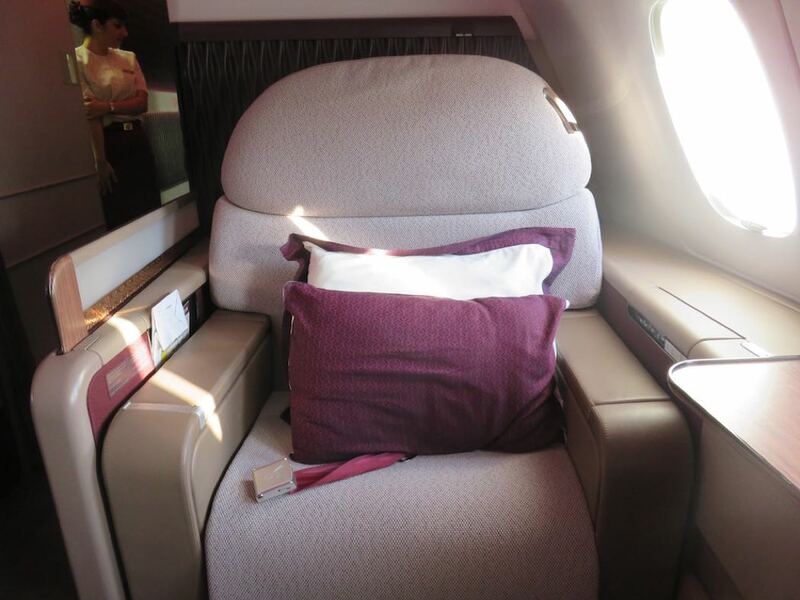 I have compared Qatar First Class to British Airways, Emirates and Etihad in First. If you are looking to book any premium flights or luxury hotels, don’t forget to contact our Luxury Travel Concierge for complimentary upgrades, discounts, free breakfasts and more. Qatar Airways has a very impressive premium check-in area, tucked away in a discrete corner of Hamad International Airport’s departure terminal. A minimalist wall points Business Class passengers to the left, and First Class passengers to the right. The First Class check-in area consists of a lounge space and several private sit-down check-in desks. From the premium-check-in area, it was a short hop to the immigration and security check-point, from where an elevator took me directly to the impressive Al Safwa First Class lounge. During the whole process, from check-in until arrival at the lounge, I was escorted by a member of the Qatar Airways ground staff. After entering the plane through the massive boarding door, I was greeted by a flight attendant who guided me to the First Class cabin, located on the forward upper deck of the A380. 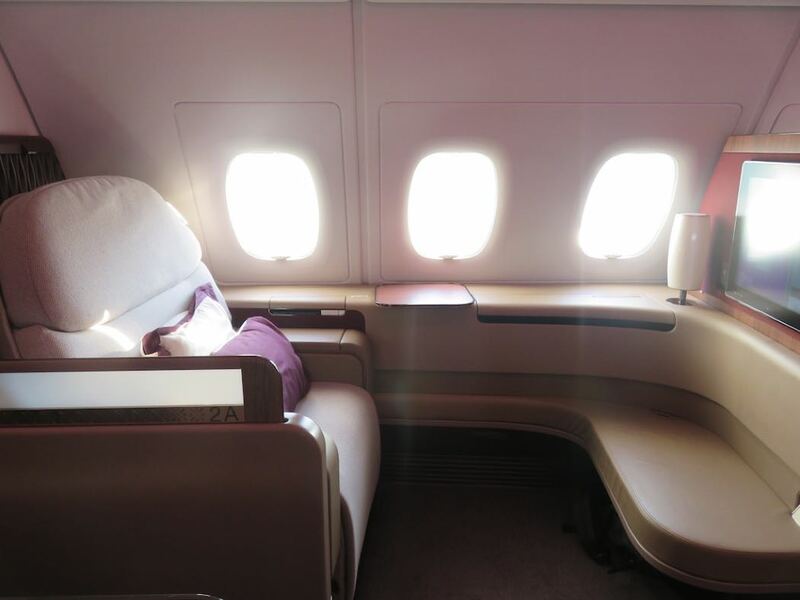 The intimate cabin has a very airy and spacious feel because it does not have completely enclosed suites like on the A380s of Emirates Business Class and Etihad First Class Apartments. The cabin features a pallet of calming colours that match quiet well together: pink (cushions, tv screens), beige (seats) and brown (wood panels). There are 8 seats, spread across two rows in a 1-2-1 configuration, all of them having direct aisle access. The 4 First Class seats on the sides are ideal for solo travellers with a generous 3 windows per seat, offering great views, while the 4 seats in the middle are perfect for those traveling with a companion. But if you are a solo traveler and you end up in one the middle seats, there’s no problem as you can raise a divider for added privacy. In the front of the cabin, there is a small bar (with crisps, nuts, bottled water, and juices), a library (with magazines), 2 lavatories, and the stairs to the lower deck. I was seated in seat 2A. Qatar Airways First Class seat features an open design, although you can rise a partition for added privacy. The seat is extremely comfortable and has very generous dimensions, with a width of 23 inches (59 cm) and a length of 83 inches (210 cm). In front of the seat, there is a large ottoman, a large TV screen above the ottoman. It’s not a touch screen TV; you have to select the entertainment of your choice with a remote control. The ottoman has some storage space underneath, and can be used an extra seat when you want to dine with a companion. One side of the seat features a reading lamp, a cabinet which holds a bottle of water and the remote control for the entertainment system, a tiny storage space which contains some magazines and the safety briefing, a small table (for drinks and snacks), and a very large tray table (which can be pulled out from the side of the seat). The other side of the seat features the seat controls, power ports, storage for the headphones, and a divider which can be raised or lowered. The seat reclines into a fully flat-bed. In fact, this was the best bed I’ve ever slept in at 40,000 feet. 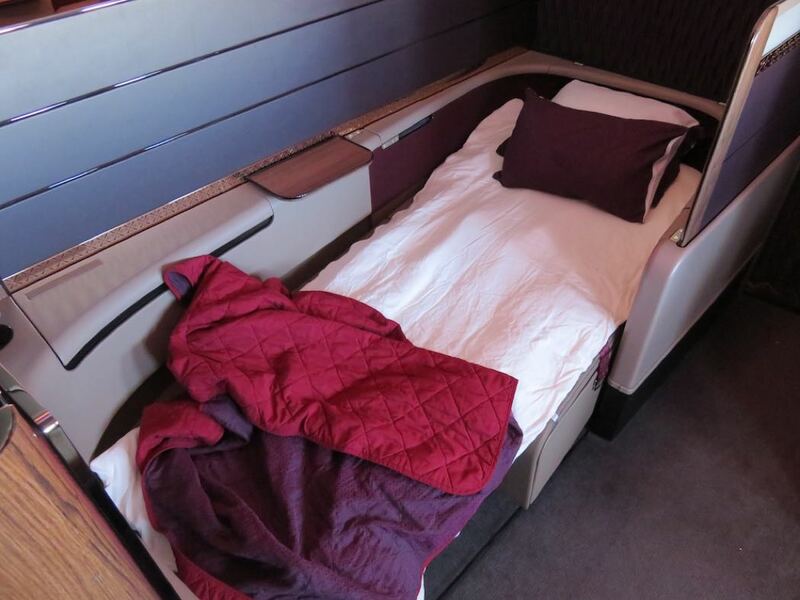 The Qatar Airways cabin crew told me it’s the largest bed in the skies. Not sure whether that is correct, but it felt very spacious. Upon boarding, I was served a welcome drink (I choose orange juice), croutons, and a refreshing towel. Breakfast was served shortly after takeoff. I had the cured salmon with citrus fruit, avocado purée and fish roe, while my choise of entree was the chicken and potato rosti, sambhar, wilted spinach, and coriander crème fraîche. It al tasted delicious although I found the portions rather small. 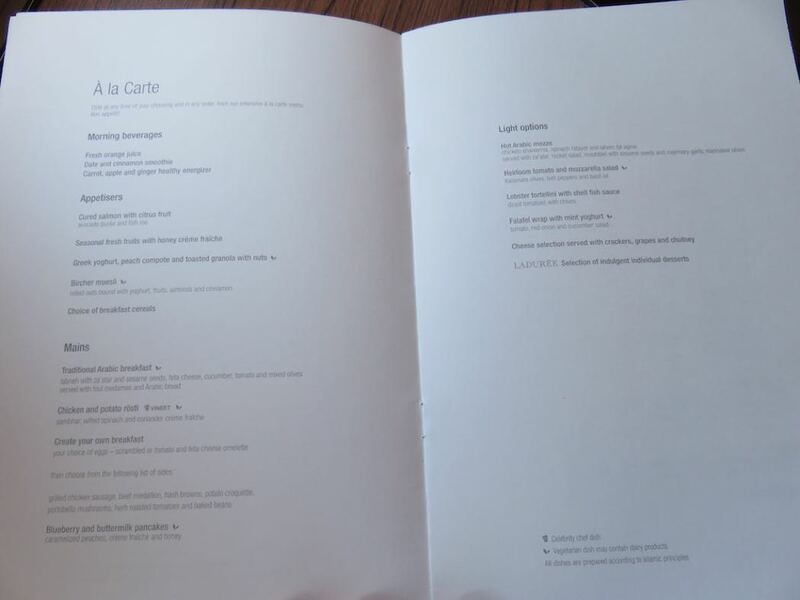 However, in Qatar Airways’ First Class, you can dine any time of your choosing and in any order, so a couple of hours later, I ordered some more dishes as a light lunch. 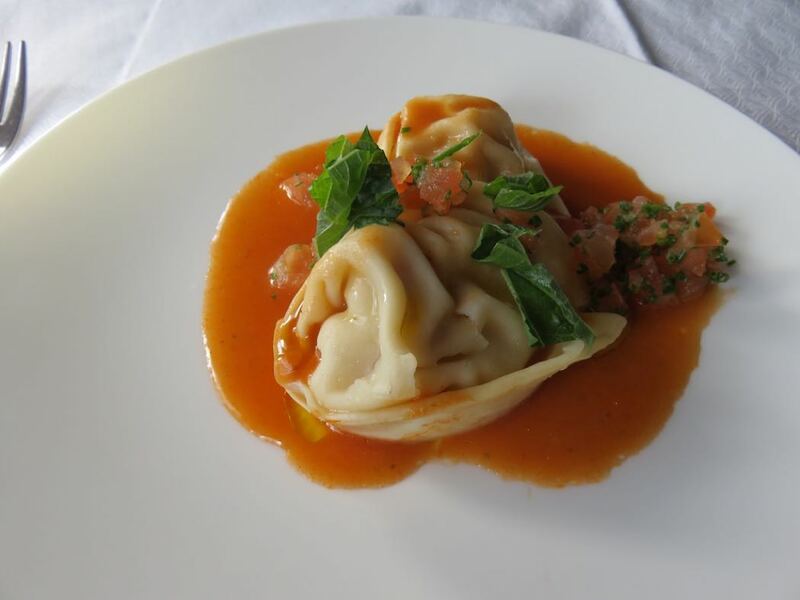 I had a starter composed of Heirloom tomato and mozzarella salad, Kalamata olives, bell peppers, and basil oil, followed by a small entree of lobster tortellini with shell-fish sauce, diced tomatoes with chives. As a sweet finale, the only option was a selection of indulgent individual Laduréé desserts. 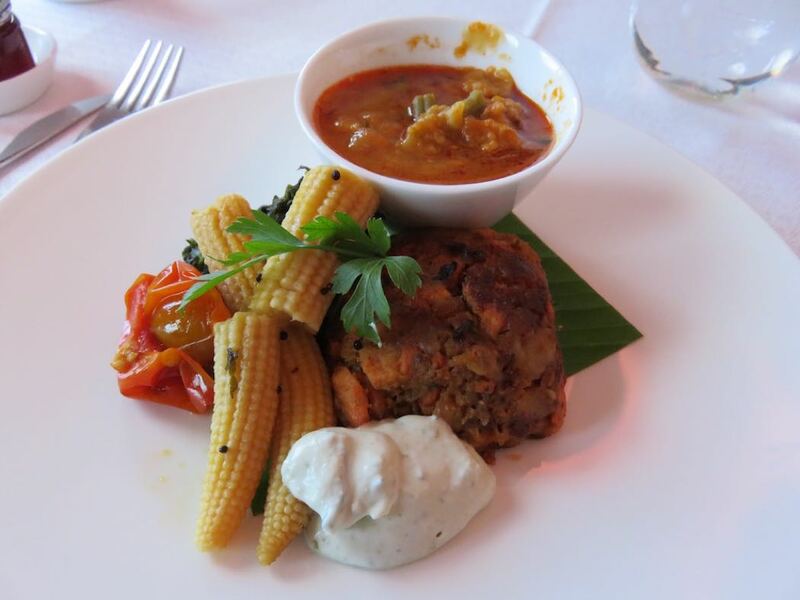 Qatar Airways is consistently better than the food on Emirates and Etihad Airways. 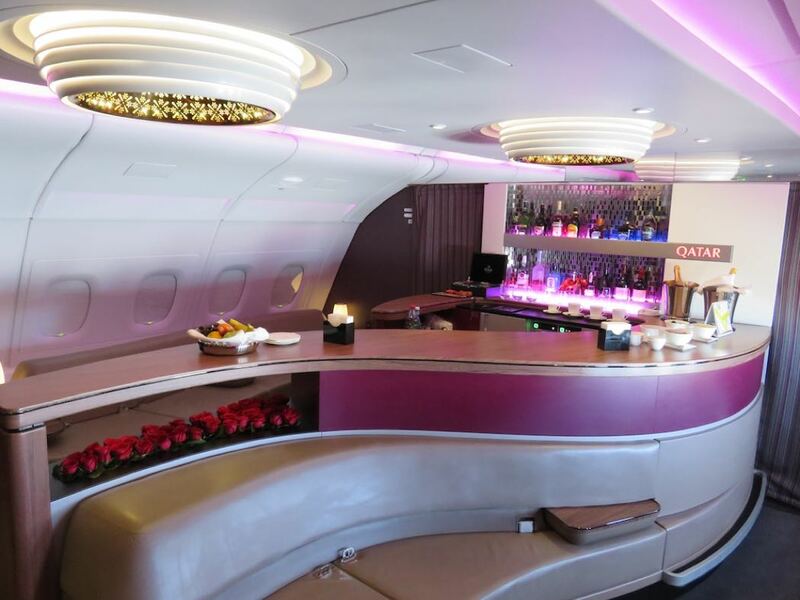 Qatar Airways also features a stunning onboard bar located at the rear of the plane, between the Business Class cabin and a small Economy Class cabin. The bar is curved, with leather sofas on both side of the bar area. It has stunning chandeliers, inspired by contemporary Arabian design and fresh flowers (see pictures below). 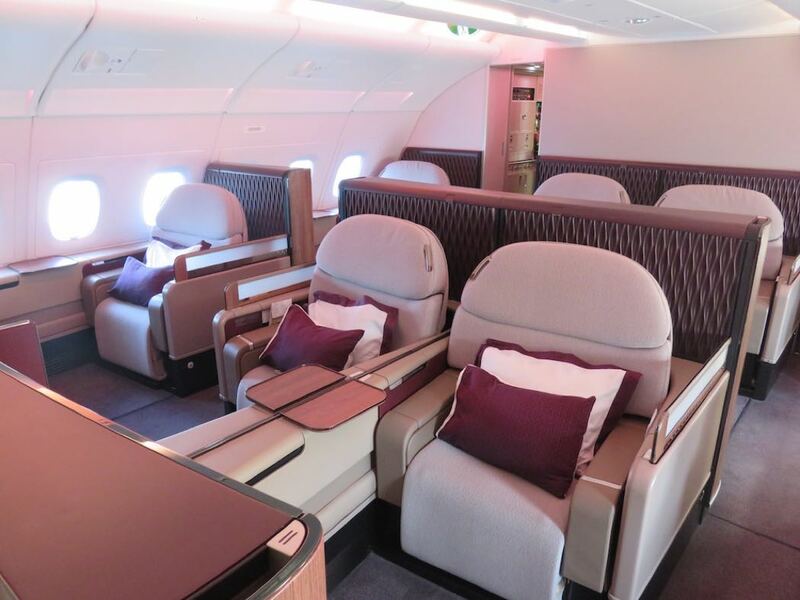 What are the best First Class seats on Qatar Airways’ Airbus A380? Single travellers should choose the window seats, while companions should choose the middle seats. 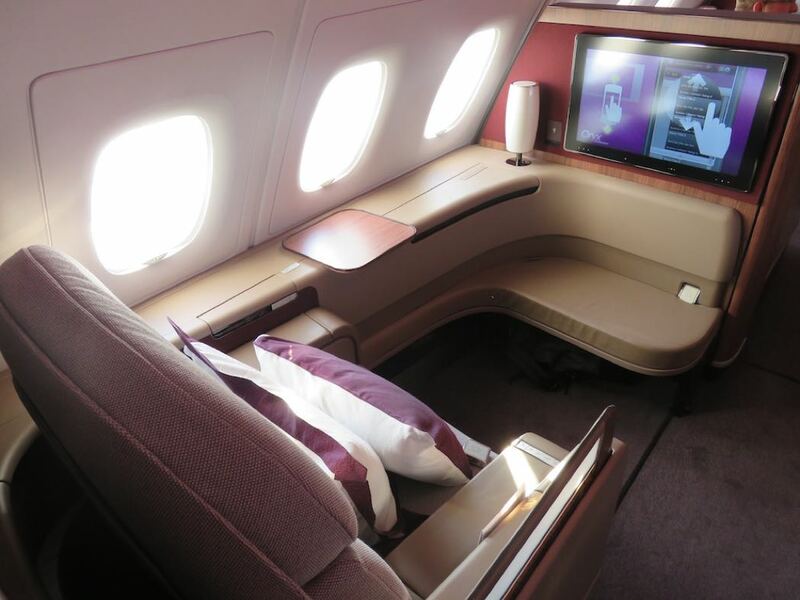 There are simply no bad seats in Qatar Airways’ A380 First Class cabin. Qatar Airways’ First Class passengers can take home a stylish Giorgio Armani bag, packed with bits for the flight and bathroom back at home. 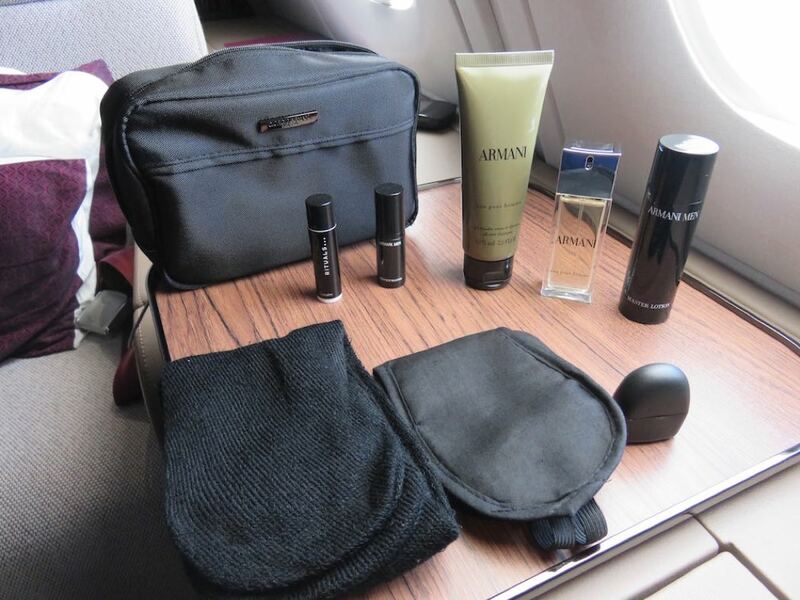 The amenity kit contains Armani perfume, body lotion, shower gel, and shampoo as well as eyeshades, socks, earplugs and lip balm. Pyjamas were not provided on this day flight. First Class passengers also receive complimentary WiFi while flying Qatar Airways. The internet speed was decent. 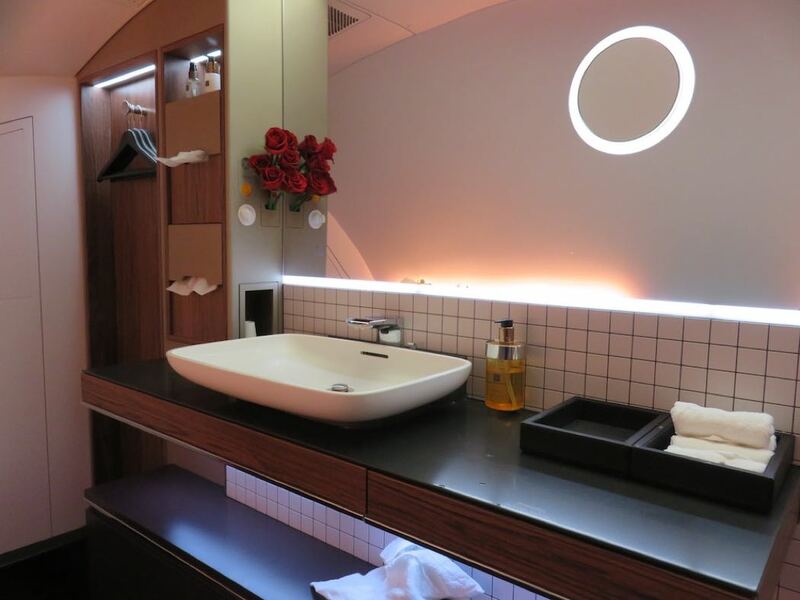 Qatar Airways’ A380 First Class cabin has 2 very large lavatories – so large that I bothered to include a picture of them in the scroller below. Both feature a bench, large mirrors, a sink, luxurious toiletries, and flowers. In contrast to Emirates and Etihad Airways, there are no showers. Normally, the flight path from Doha to Paris goes straight over Syria and Iraq, but the plane detoured around the current ISIS conflict area by flying over eastern Iran. Unfortunately, Qatar Airways does not provide complimentary chauffeur-driven airport transfers for its First Class passengers (in contrast to Etihad Airways and Emirates). Qatar Airways has best bed I’ve ever slept in at 40,000 feet. 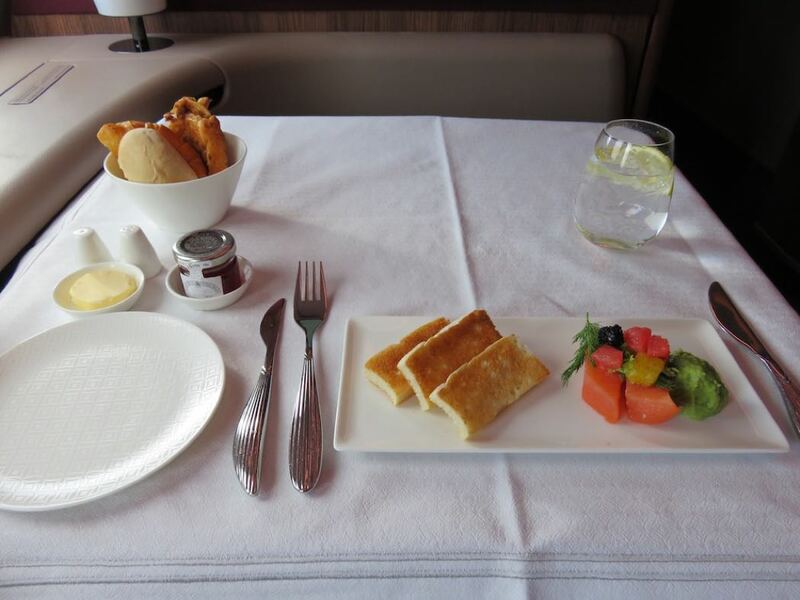 Qatar also offers excellent food, luxury toiletries, and a stunning onboard bar. But the highlight was my pre-flight experience at Qatar Airways’ Al Safwa First Class lounge, unquestionably the most luxury airport lounge in the world. 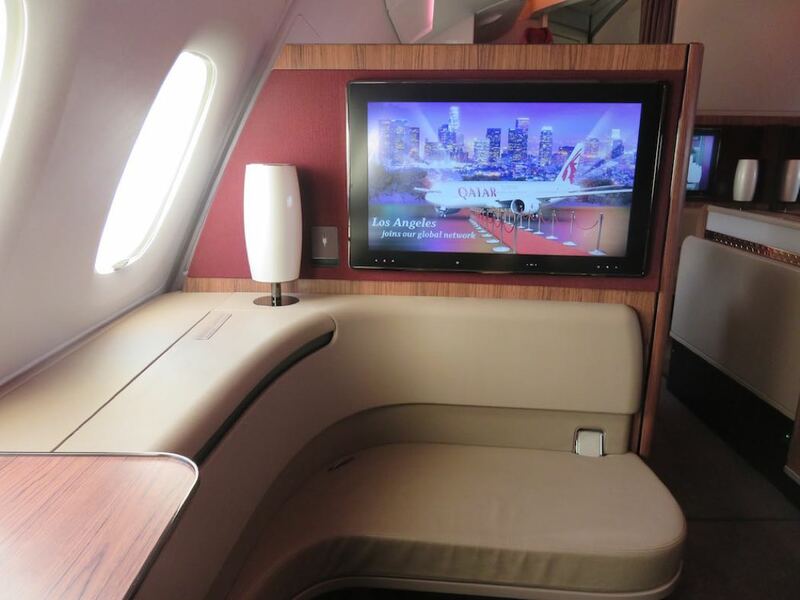 If you enjoyed this review you may be interested in my other Qatar Airways Business Class flight reviews and my other Qatar Airways First Class flight reviews along of my review of Emirates vs Etihad vs Qatar Airways: Best Airline In The Middle East.